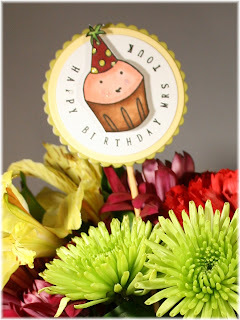 Stamp a Sweet Impression: Birthday Teacher Surprise! Hi All! So today I have a fun little ensemble to share with you. Last Thursday was Josh's teacher's birthday. The school asked the kids to send a flower with each student as a little gift. Well, my wheels started churning immediately. LOL! Since my MIL has a flower shop I have easy access to vases and flowers. I headed over and made a quick and easy arrangement. Then, I went home and started on the fun stuff. I decided that I needed a cute flower pick to display the note and recipients name. So, I came up with this little cupcake embellishment. I used the SASI "Sweet Celebrations" along with my JustRite mongrammer. I also used my circle nestabilities to create the embellishment. This was all glued to a bamboo skewer with Taylor's stickly tape. (Love that stuff!) On the back I also glued another scalloped circle. I wrote Josh's name on the back of that circle. When I finished, I decided I needed to make a cute card to go along with the arrangement. I picked the adorable ice cream cone as the main image. I wanted to make it quick and simple. I really like how it turned out and the teacher seemed to love it too! 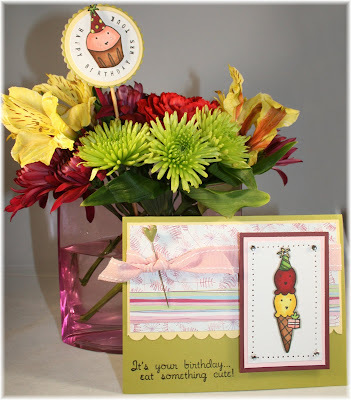 Stay tuned for more fabulous cards and projects from the rest of the Baker's Dozen! Ana, this is ADORABLE! Oh my goodness! OMGosh...this is adorable! Your coloring is perfect!! Oh, what a pretty and heartfelt gift! !